You may remember last month when I posted about a large project M and I are working on. 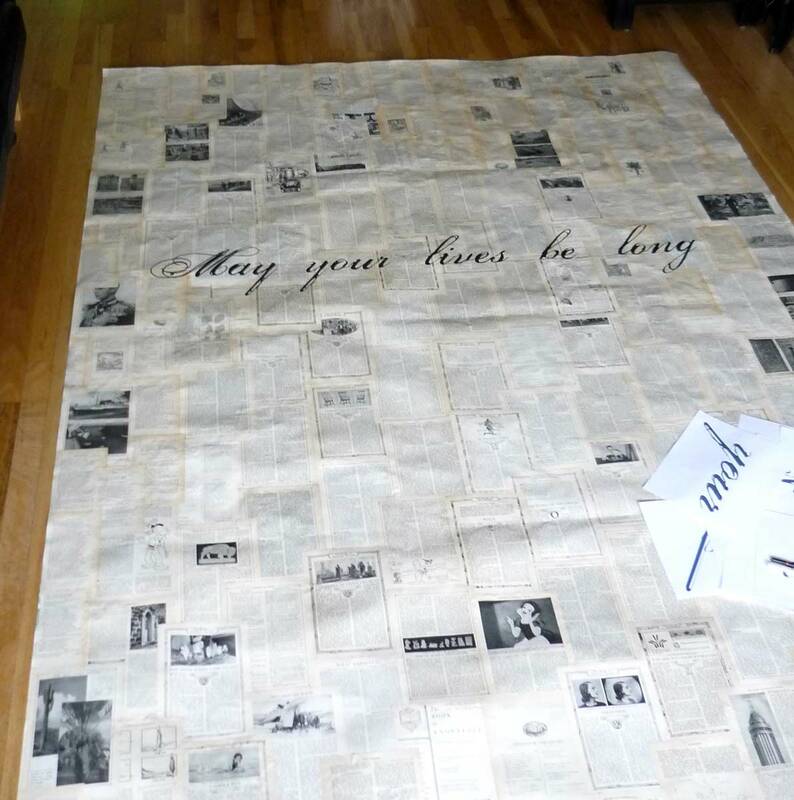 It’s a 6-foot by 10-foot paper banner collage made from old book pages and Mod Podge. Well, this huuuuuuge canvas has just been rolled up and hanging out in our kitchen for a month, looking awkward and taking up space. We didn’t get to step two until this week. The next step was to paint words onto our cool collage. We want three different excerpts, though at the moment we’re only positive about the one that will go in the center of the banner: a song lyric from one of my favorite bands, Cloud Cult. 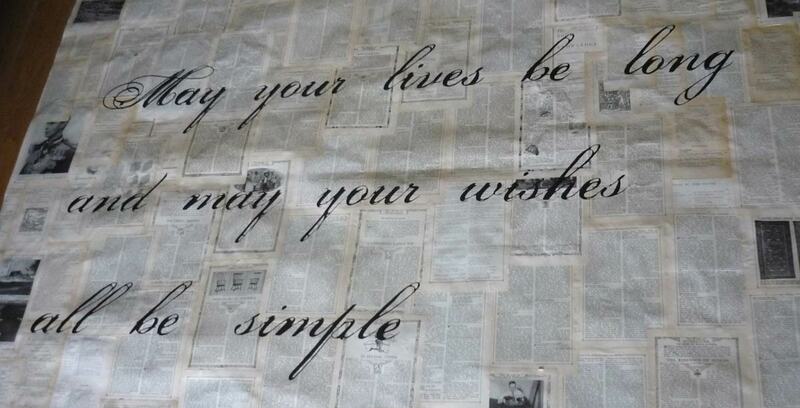 May your lives be long, and may your wishes all be simple. You can listen to the song here – it’s a haunting song, that builds and builds. This lyric is taken from the chorus, and I love the sentiment. 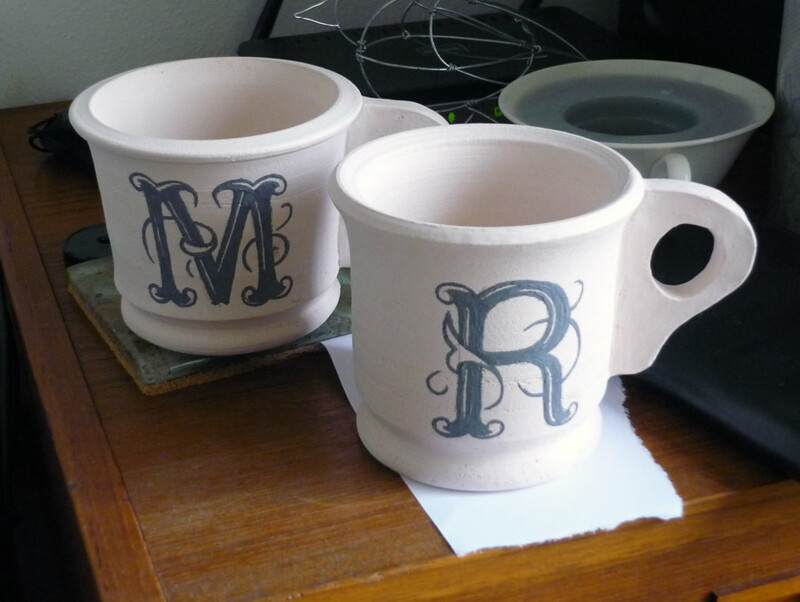 M and I both think it exemplifies what we want our wedding to be about. After penciling in a straight horizontal guideline for the words, we used the ol’ “graphite on the backside of the paper” trick to make a kind of carbon-copy. 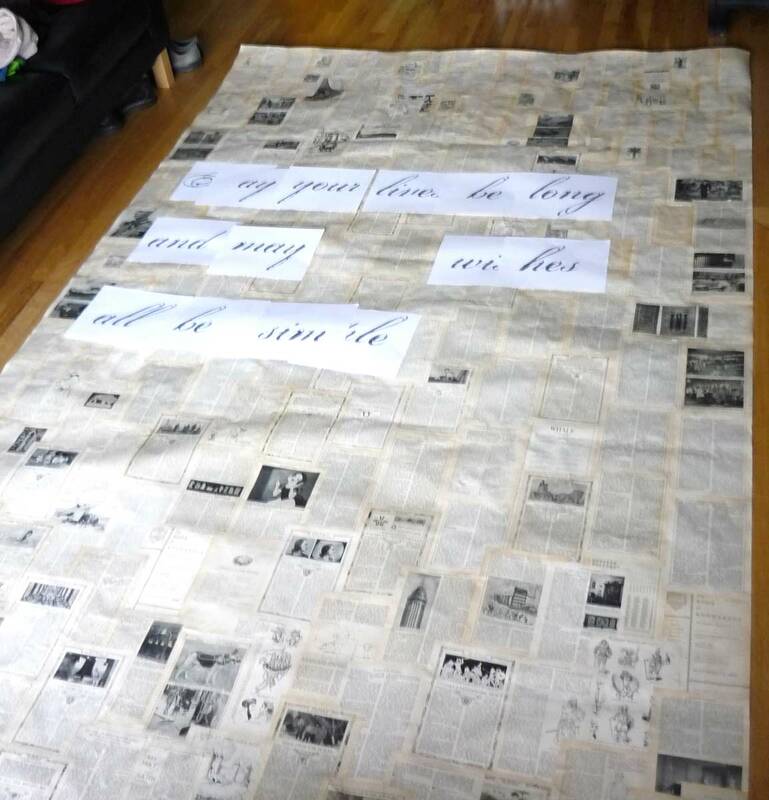 By tracing the letters with a ballpoint pen, the pencil outline gets transferred onto the banner. With the pencil outlines in place, I used a fine tipped paint brush and filled in the letters with black acrylic paint. Don’t you love how the words really pop? I was afraid the text would get lost in the background, but it really works! Obviously this was an ambitious project due to the sheer size of our banner, but I think this could be a very fun small-scale project too! 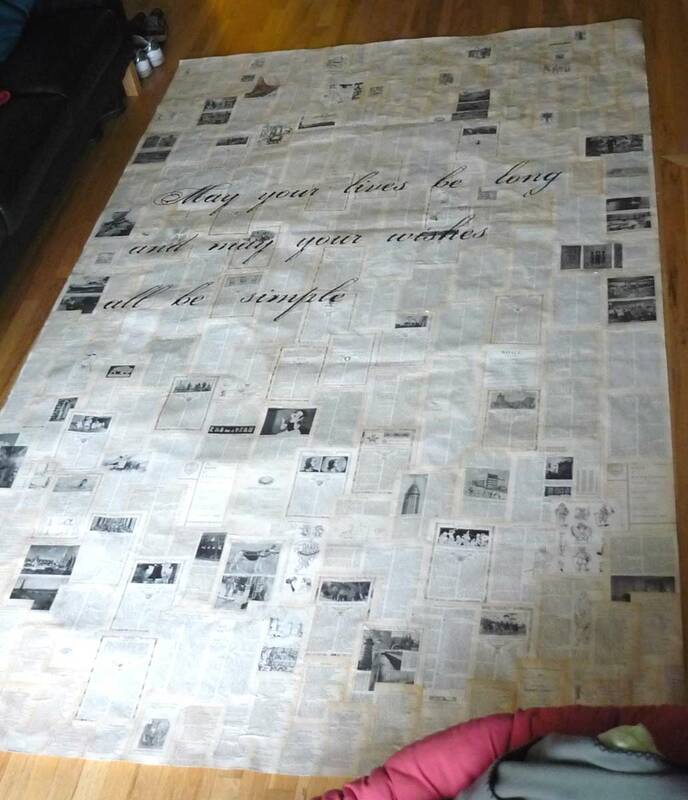 All you need is some book pages, something to mount them on (like another sheet of paper, cardboard, particle board, etc), Mod Podge to apply the pages, and then some kind of text or graphics to place over your background. You could paint on the letters like we did, or you can even get vinyl stick-on letters from an office store or stationery supply store. 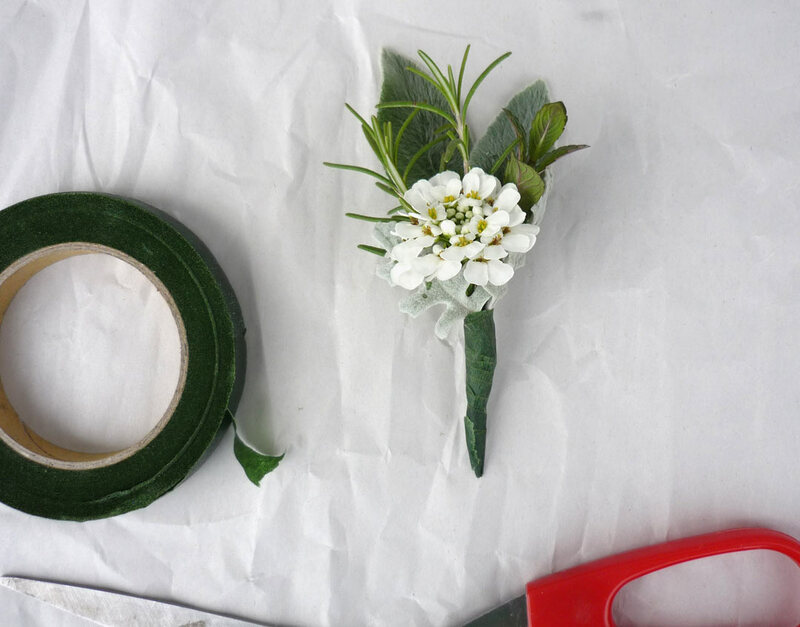 It’s a great project to get creative with. until we get figure out the other two sets of text! I had a dilemma on my hands, because for the past few days I had a bowl of three egg whites sitting in my refrigerator. They were the leftovers from a couple other recipes I had made that only needed the yolks. So what does one do with leftover egg whites? I know you can make egg-white omelets, but those have always grossed me out a bit. I thought maybe some sort of meringue pie would be nice…but I didn’t really want to make a whole pie. 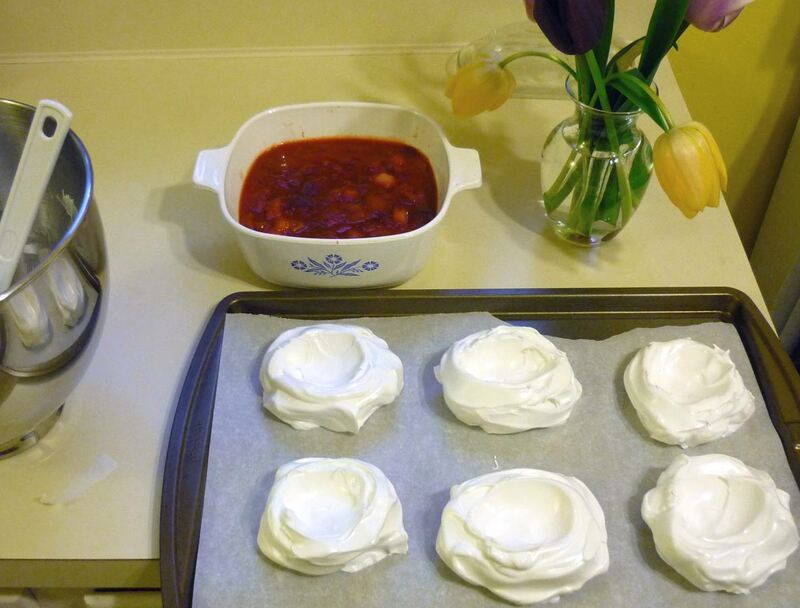 After a bit of searching on the ol’ internets, I found this recipe for Pavlovas on one of my favorite foodie blogs, Simply Recipes. 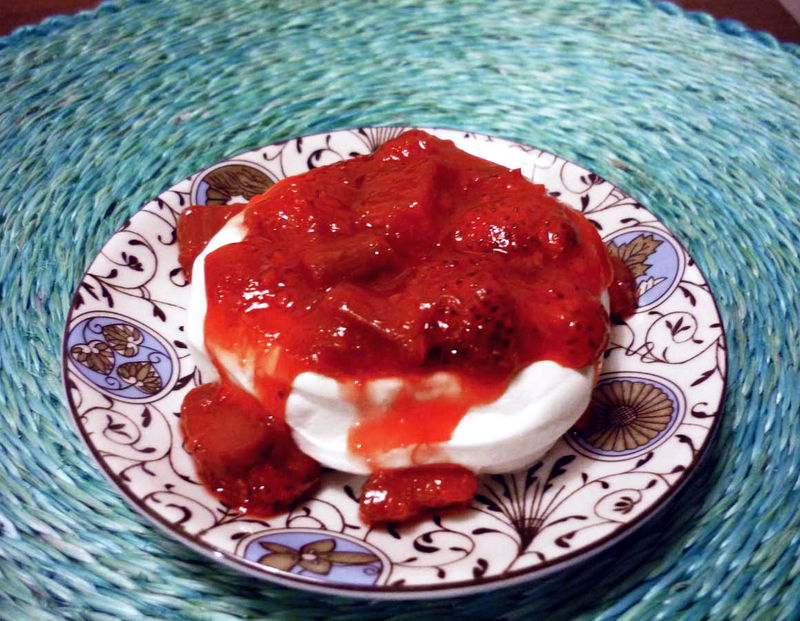 As of last night, I had never heard of a pavlova, but what sold me on it (other than using up my egg whites) was that it’s a great way to serve seasonal fruit, and I just bought a bunch of rhubarb and strawberries. 🙂 Perfect. 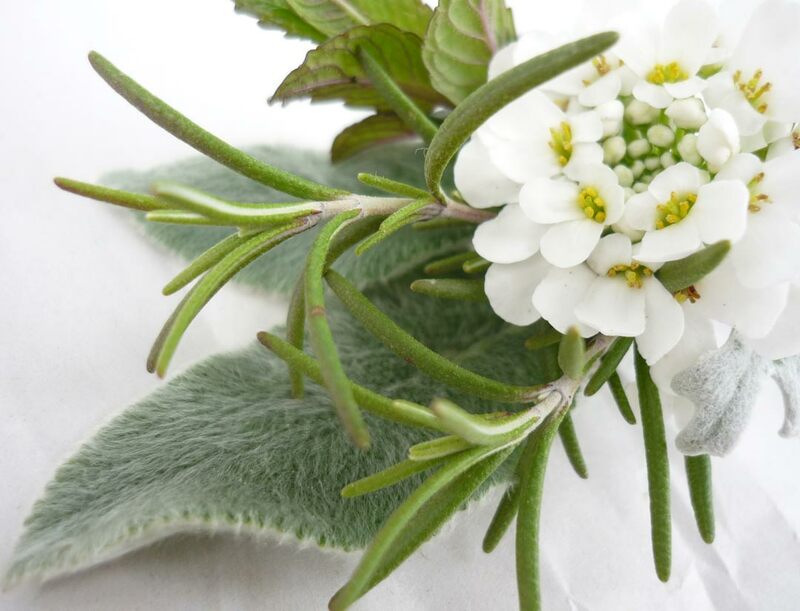 The recipe is very simple, and it has great instructions and pictures for you to follow. 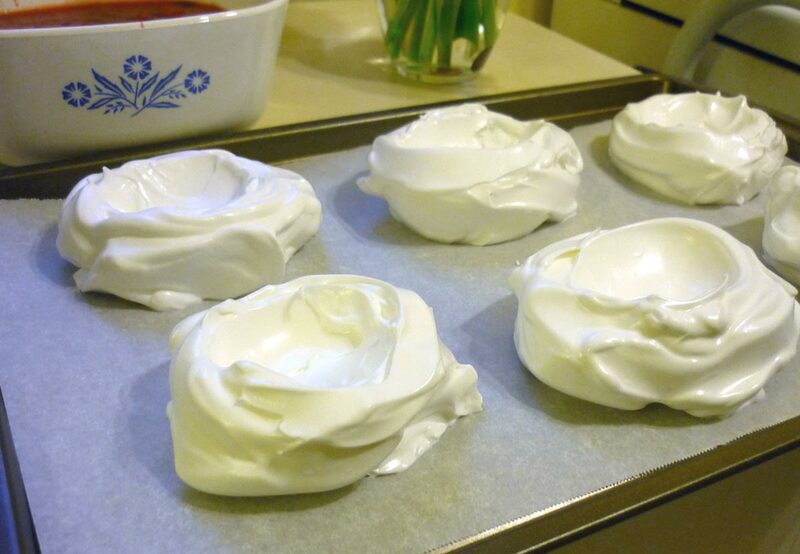 I cut the recipe in half (for 3 whites instead of 6) and I still got six large pavlova boats from it. 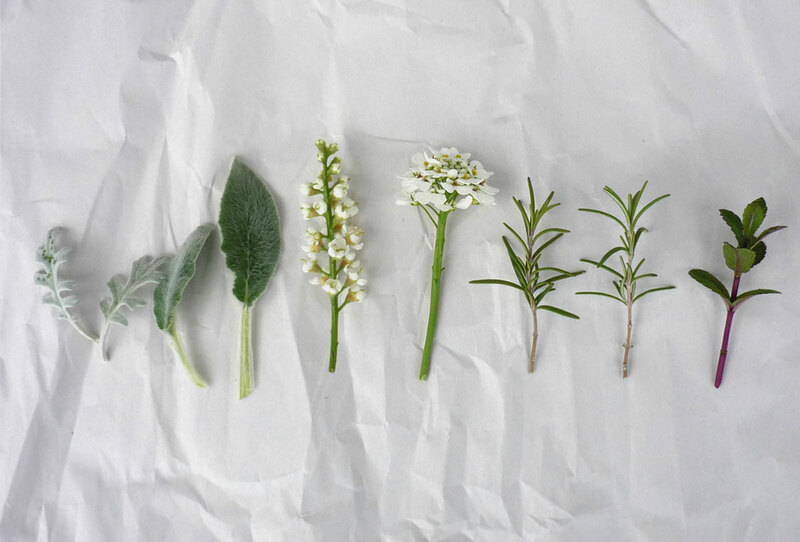 And they look beautiful! This is definitely an egg-white recipe I’ll be using again! After assembling my own little moss terrarium (made from a 69 cent bowl from Goodwill and moss from the backyard), I was inspired to make some super cute little accessories, and now I’ve put some of them in my Etsy shop! I think these little guys are so adorable! 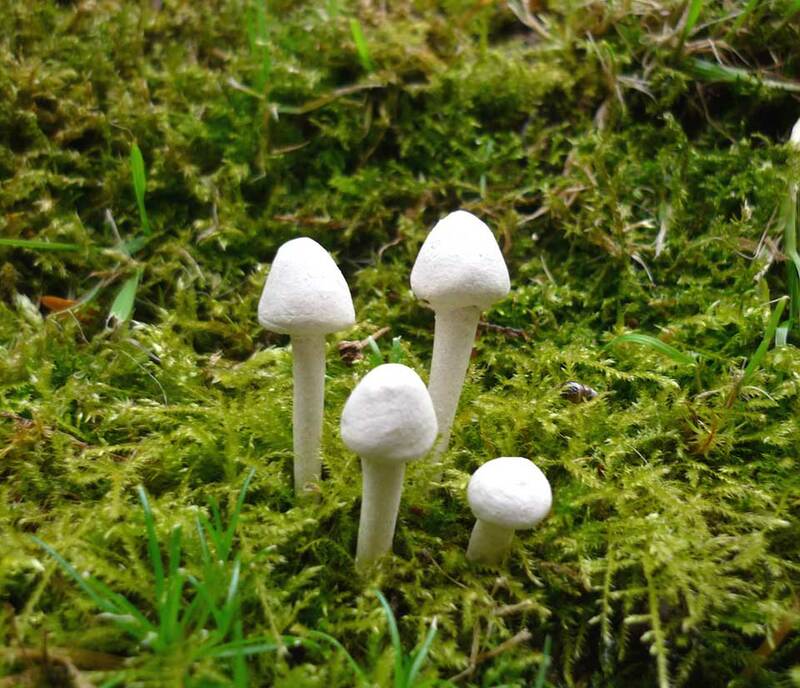 The tall skinny ones are modeled after enoki mushrooms, which are so cute. We had a very fun weekend, with lots of driving for me. Here are some of the highlights I was able to capture with my lil camera. 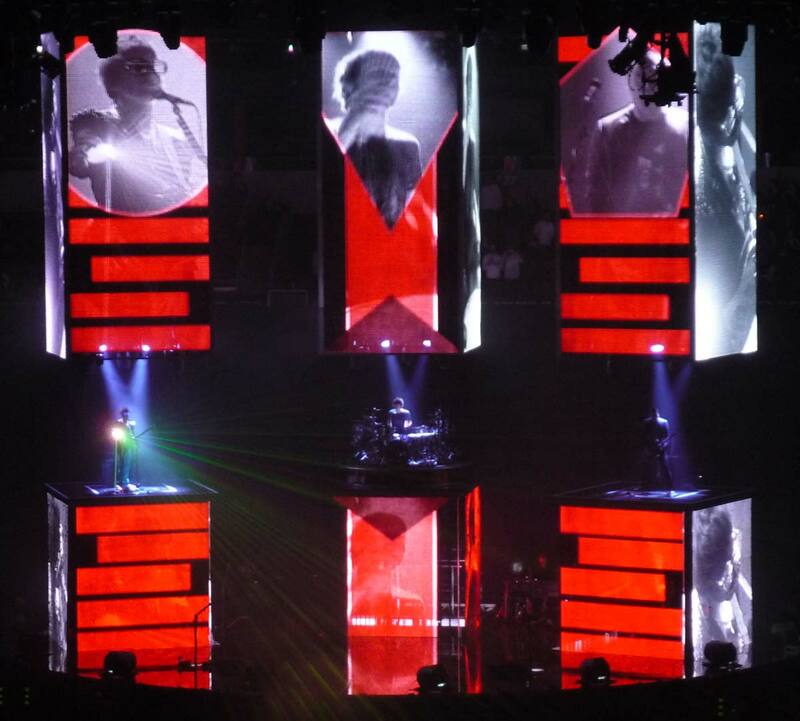 We got free tickets to the Muse show at Key Arena on Friday, thanks to M’s awesome coworker who had the hook-up! Our seats were so great (we were in the fancy XO Boardroom in the box-seat level!) and the concert was a fantastic spectacle. Those Brits do know how to put on a memorable performance! 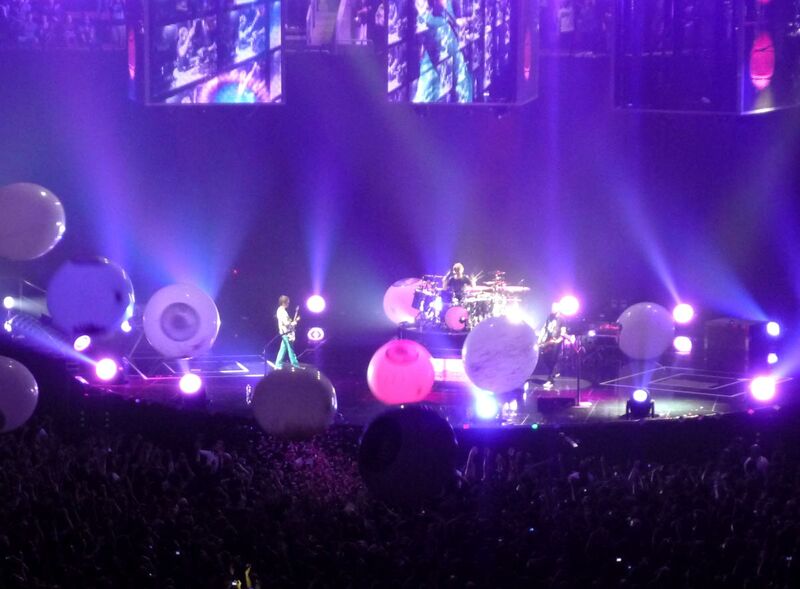 Complete with 50-foot moving stage towers, lasers galore, and a finale of giant balloon eye-balls filled with confetti. Also from that kiln load was a set of bowls I DO plan to put in my Etsy shop, but they’re not quite ready yet. 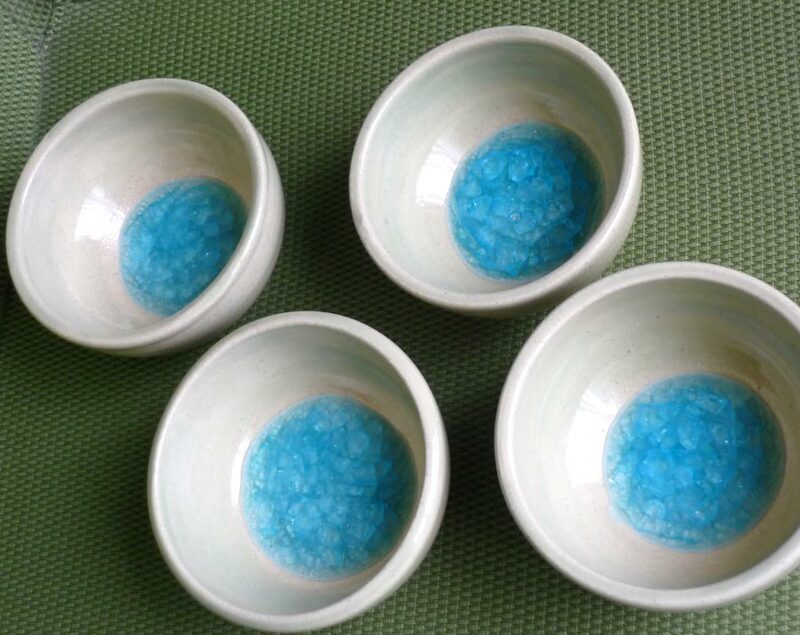 I made these super cute little bowls, which I glazed in Celedon Green, and put shards of glass from a Sapphire Gin bottle at the bottom (such a gorgeous blue color!). I’m not quite happy with them yet, so I think I’ll be firing them one more time before they go in the shop. 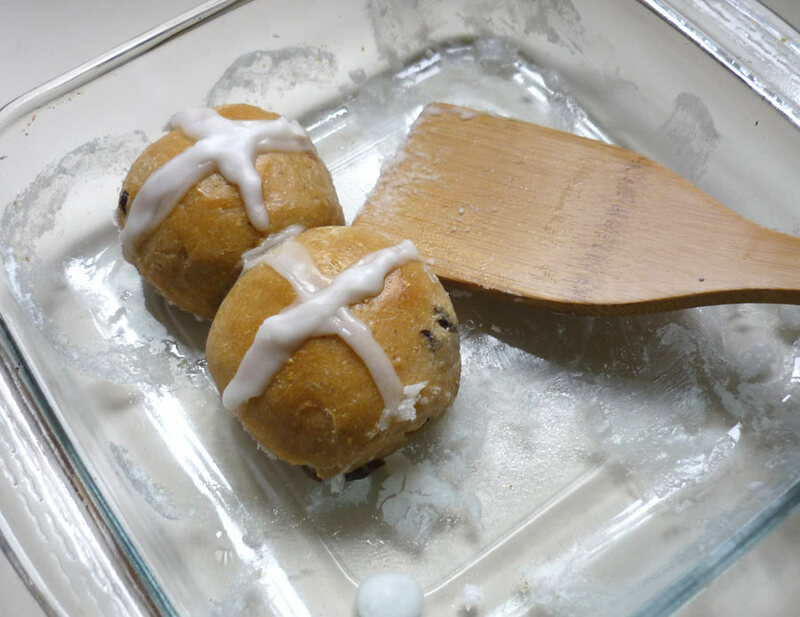 And for Easter I made Hot Cross Buns for a breakfast treat – so yummy, chock full of raisins, lemon zest, cinnamon and nutmeg, topped with a sugar glaze. And I read about the interesting history of the Hot Cross Bun – there is more to this pastry than the song you learn on the recorder in 5th grade. M had to work on Easter, but we were still able to get to my parents’ house for a lovely dinner in the evening. All in all, it was a great weekend. Happy April 1st! Nope, no April Fools jokes for me today. 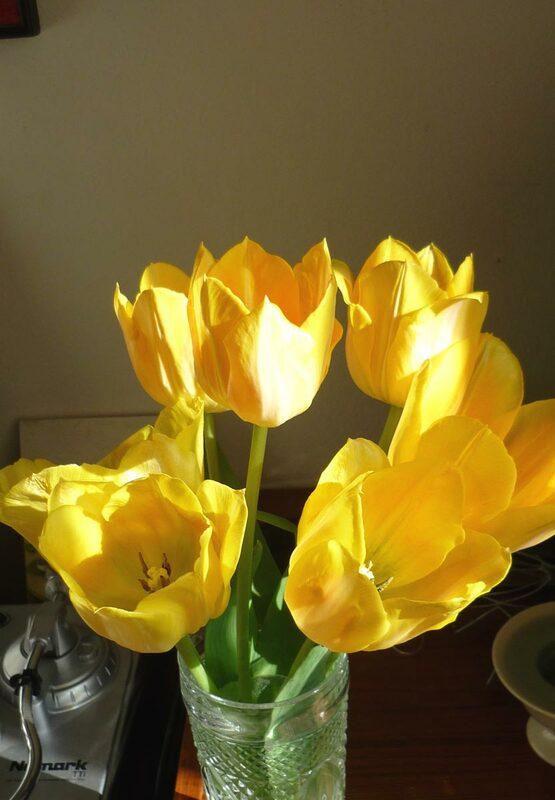 But I do want to share some pics of my pretty pretty tulips that have finally bloomed! 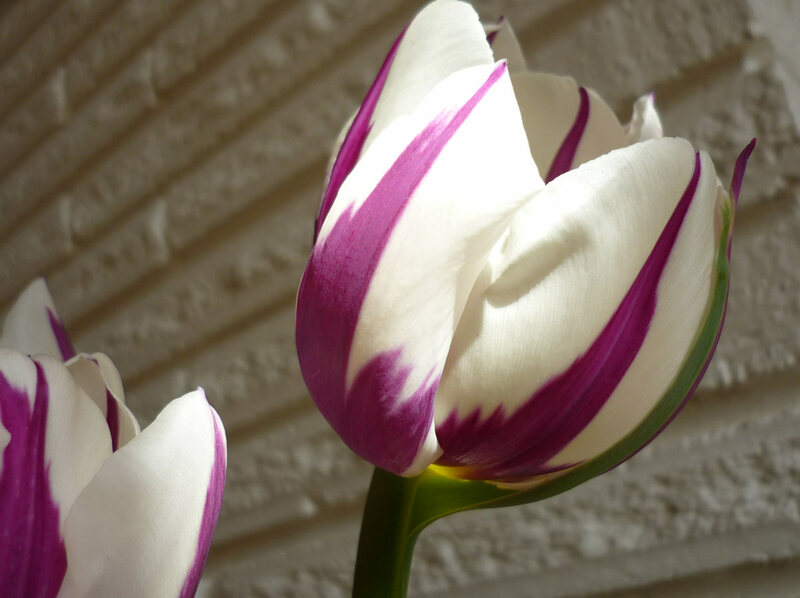 These purple and white tulips are just gorgeous. 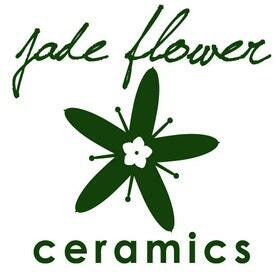 I still have some fiery orange ones and cool minty green ones on the way.